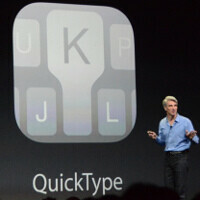 Still, Apple's QuickType will learn your typing habits on the device and won't do it from the cloud. It was said that this is being done in order to protect the privacy of the user. iOS 8 will also support 3rd party keyboards, so it will be rather hot on the iOS keyboard front this fall. We are more than eager to test out QuickType and see how it fares against its cross platform rivals. You can check out some images of iOS 8's QuickType in the gallery below. You can also see what the refreshed version of Apple's OS has in tow for us here. And if google take anything from ios apple will bring a law suit... "why google copied? we are the only one permitted to copy"
They just brought half a decade of innovation to iOS today. These features were available on WP and WM before they came to Android. I like iOS 8 and its flexibility tbh. I see myself using an iPad pretty soon. well, your name and profile picture says it all. Nokia. Dinosaurs and now Apple. lmao. Nothing changed, i'll stay with Windows Phone. Better in what terms? No notification bar? popular apps? I think ios and android as much superior than windows phone. Haha, amazing, Apple, just amazing. And the iFans will just know it that Apple invented this. Apple is now a follower, no longer a leader. Copying Android all the way. No new revolutionary innovation from Cupertino anymore. Exactly. This reminds me.......I just said a few weeks ago Apple is no longer trend setters.....this is even more proof of that. Nice for the iPhone users that wanted more customization without jailbreak. But Apple is going to stay playing catch up for a few years....I cant see what else they can do to be leaders anymore. Unless its some wild gimmick. Maybe announce 3D now that its died down in Android land. Thats actually true and after reading so many Apple Fanboys' comments, I felt that Apple users are actual unaware that these features/technology has existed for more than 4-5 yrs. And they have only come to know about it now in 2014 and start thinking that Apple has innovated & created something "NEW".. Poor Apple users.... They have missed so much over these yrs... Actually happy for iFans.. Now they may get what they pay ($$$) for..
Looks like Samsung is in for another lawsuit over their predictive keyboard that has shipped with Samsung devices for years, but somehow still copied it from Apple. Samsung went into the future in time machine and copied the Apple features... & btw.. That time machine was also made by Apple..
this so helpful, not a gimmick. Not at all. With the latest announcement of Siri voice activation, Apple has come from talking a page from Android's book to grabbing the whole book and running out the store without paying. Wth? Seems like all announcements today by Apple are just copycat features... Every one of them has been done on other platforms. What a disgrace Apple has become. It's funny how the comments continually reference "iFans", yet all I see here are people bashing one platform and praising another. Where are these iFans that you guys seems to despise so much? What makes you any "better" than them based on the content of YOUR posts? iFans are the people who would be yelling that Android stole these features if Apple had them first, yet have no issue with Apple taking ideas from others (and in extreme cases they have no issue with Apple trying to patent the ideas they took from others and using those patents against the originators) But yes, there are idiots on both sides. "Where are these iFans that you guys seems to despise so much? " Most are lurking in silence, reading in silence....because they have nothing to say today. In a few weeks they will be back.